Wow. That is an impressive fountain. 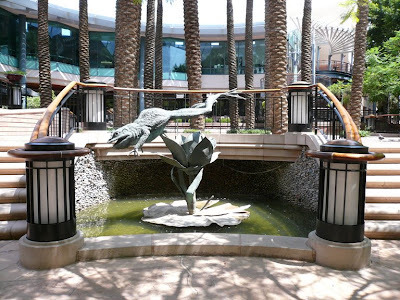 When the Arizona Center originally opened, this fountain -- along with a couple of others -- were definitely some of the jewels in its crown. This particular fountain originally had a fog effect, which sent billowing fog onto the sidewalk, cooling the air immediately surrounding the fountain during warm weather. I don't know if it's still fully functional, but it was mesmerizing to watch. I bet this area is jam=packed with tourists during the winter months. It looks very a spot most tourists would gravitate to.